The National Institutes of Health (NIH) says it will end controversial monkey experiments at a lab that is part of the Eunice Kennedy Shriver National Institute of Child Health and Human Development (NICHD). 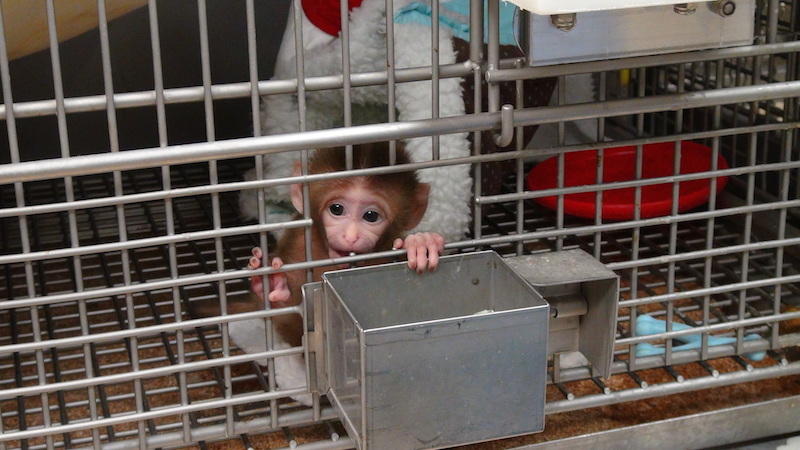 For years, the lab in Poolesville, Maryland, under the direction of Stephen Suomi, conducted behavioral research using baby monkeys. Some studies involved separating young monkeys from their mothers at birth, startling the monkeys with loud noises, and subjecting them to invasive procedures such as spinal taps. Officials said the aim of the research was to help develop more effective treatments, or even preventive measures, for developmental problems in humans. Last fall, the animal rights group People for the Ethical Treatment of Animals (PETA) launched a campaign against this work, which involved the release of undercover videos that they said showed inhumane experiments in the lab, as well as an ad campaign across Washington, D.C. and petitions to government officials. "This is really an historic moment, so we're happy and relieved that after 30 years the agency will stop breeding hundreds of baby monkeys to suffer from depression and tearing them from their mothers at birth to cause them lifelong trauma," Justin Goodman, director of PETA's Laboratory Investigations Department told CBS News in an email. NIH did not say that their decision to close the lab was impacted by PETA. In a statement to CBS News, NICHD said, "This decision was based on internal programmatic priorities and the desire to optimize research efficiency." When PETA released the video last year, Dr. Constantine Stratakis, the scientific director of the NICHD, who oversees non-human primate research including that conducted by Suomi, told CBS News these studies had been closely monitored by the NIH and U.S. Department of Agriculture and that they complied with animal treatment standards. NICHD said they have developed a three-year plan to close the facility that will ensure "the safe transition of the animals to other facilities." There are roughly 300 monkeys at the facility. NICHD plans to transfer approximately 100 monkeys per year to other places. "Ending these horrendous experiments on infant monkeys is great progress and now we will work to ensure that these long-suffering monkeys will be sent to reputable sanctuaries where they can recover and live out their lives in freedom and peace," Goodman said. The news comes a few weeks after NIH announced it would retire the last of its research chimpanzees.